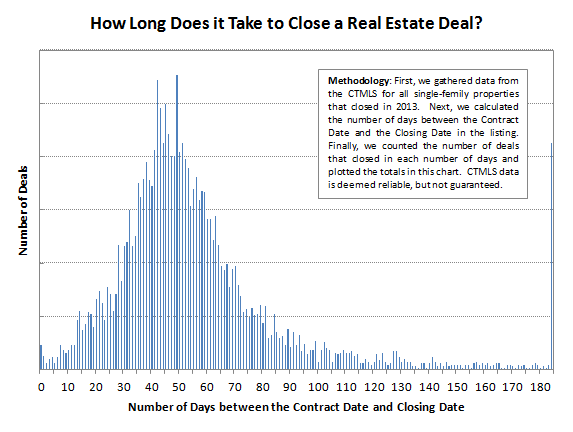 The amount of time between the contract date and the closing varies greatly – every situation is a little different. However, after looking at all of the single-family deals that closed in Hartford County in 2013 we can see some trends. The peak of the curve is between 35 and 55 days. This is the range that we usually see with our clients. It allows the buyer enough time to secure a mortgage, and the seller enough time to move out. Mentally you should plan for a closing somewhere in this window as you consider a real estate transaction. Closing dates are negotiable. Buyers usually begin the conversation by proposing a closing date in their initial offer for a home. From there, it may, or may not, get changed depending on how the negotiation proceeds. Buyers need to be more aware of the time until closing than sellers. Mortgage lenders offer rate locks to buyers and perform other due diligence that has a shelf live. You need to find a lender and get pre-qualified before making an offer on a home, so make a note to ask if they have advice on a reasonable closing timeline. The closing date will need to be a mutual agreement between the buyer and seller. In most cases it’s within the 35 to 55 day window. Understand what the implications may be if you choose a closing date in less than 30 days or more than 60 days. Your agent should be able to provide more guidance.